I have been drawing and painting since the age of three. My mother would come home with very bulky wallpaper sample books. I loved the textures and patterns of the designs, but most of all, I enjoyed the plain backs – which became my huge drawing blocks. I would spread out in front of the open fire, with crayons and paper, and silently enter my realms of fantasy, while vaguely catching snippets of adult conversation, I perhaps wasn’t meant to hear. I think I became somewhat invisible to those around me at times. As a child, my favourite piece of furniture in my bedroom was a small, functional desk. I lifted up the lid, and all my treasures were within. I still love desks, and I now work on a second hand Ikea one in my spare bedroom, which is my studio. The desk has two drawers containing my art materials – Winsor & Newton Acrylic paints, Posca pens, drawing pens, soft coloured pencils, rulers. The top of the desk is paint battered; and no amount of cleaning materials could eradicate those stains. When the build up becomes too unworkable, I will buy another second hand desk. I simply prop up my canvas on this desk against the wall, & begin to work. My only other accompaniments are a glass of wine & a good CD. I work on many sizes; though my favourite is 2 foot Square right now. I love a bare white canvas, and the opportunities it affords. 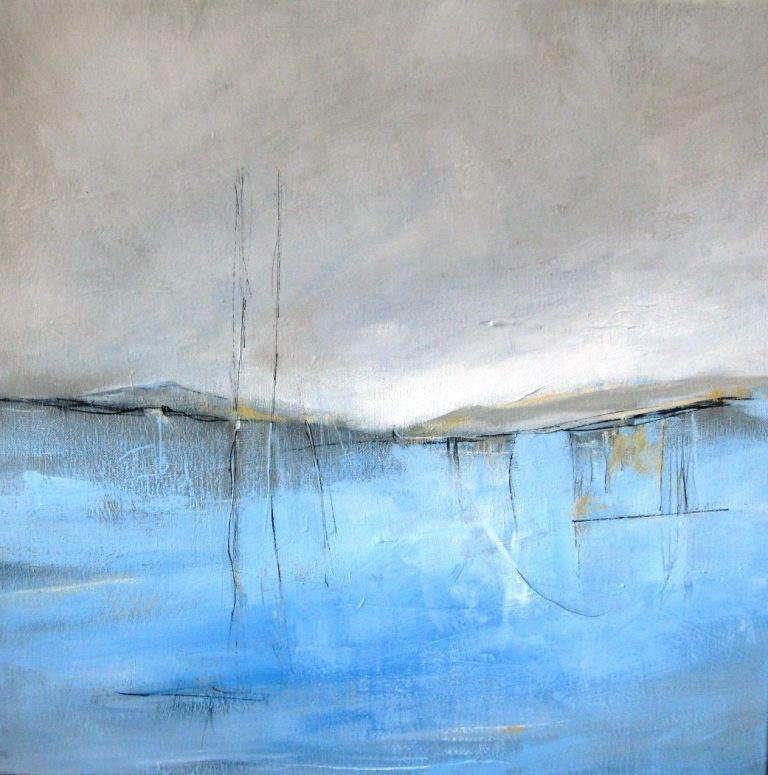 I always start with colour, straight from the tube, and usually mix my colours on the canvas. I never work from sketches, photos, or any physical/ representational ideas. For me, the colours start to integrate, and the form gradually takes shape, and starts visually speaking to me. 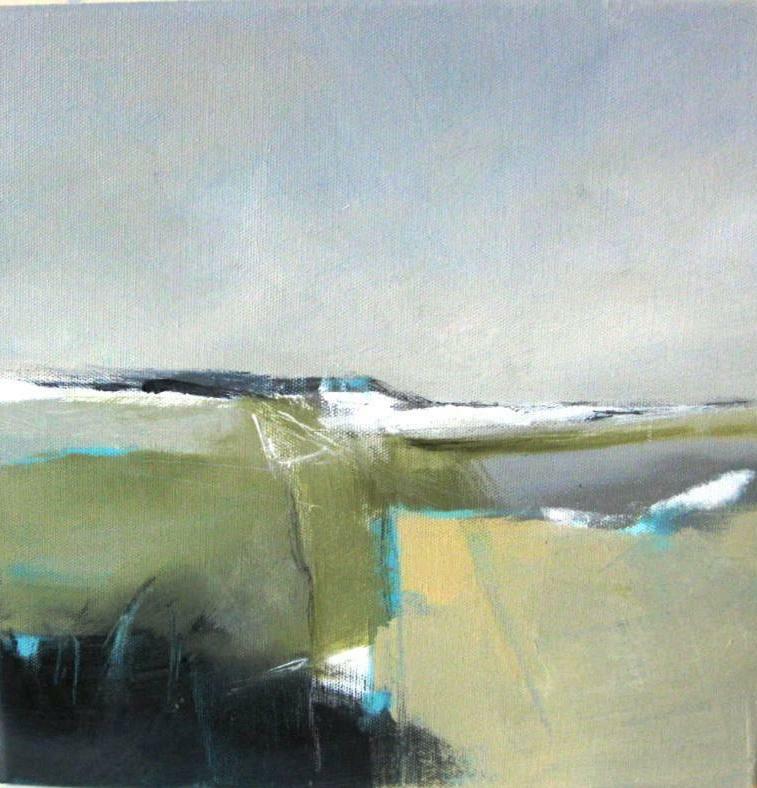 I love the application and fluidity of Acrylic paint; the way it can be manoeuvred, structured, scraped back, with Palette knives, Brushes, rollers, to reveal the layers beneath. Often, it can be a fight, as Acrylics dry so quickly, and my arm can sometimes ache with this challenging process. When starting, I have no preconceived ideas. I live near the coast, and have taken many photos of this beautiful area I live in. I think that these images are in my mind when I paint, though I am not wholly conscious of them at the start. 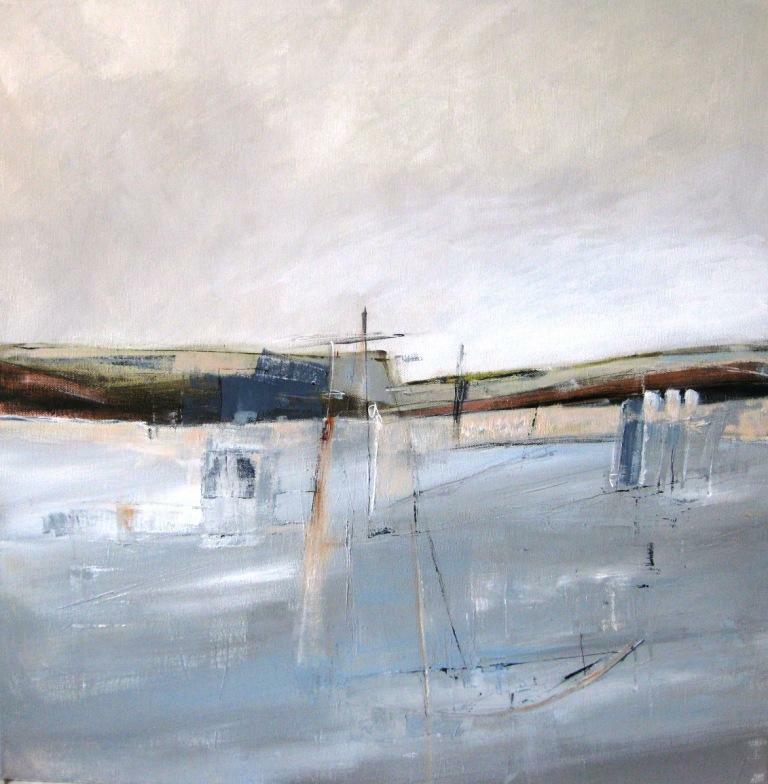 Right now, I am working on two series simultaneously; ‘Harbour’ and ‘A sense of place.’ I will often work on one for a couple of hours, and then move on to another. At some point in the process, I will turn the canvas upside down to work on. 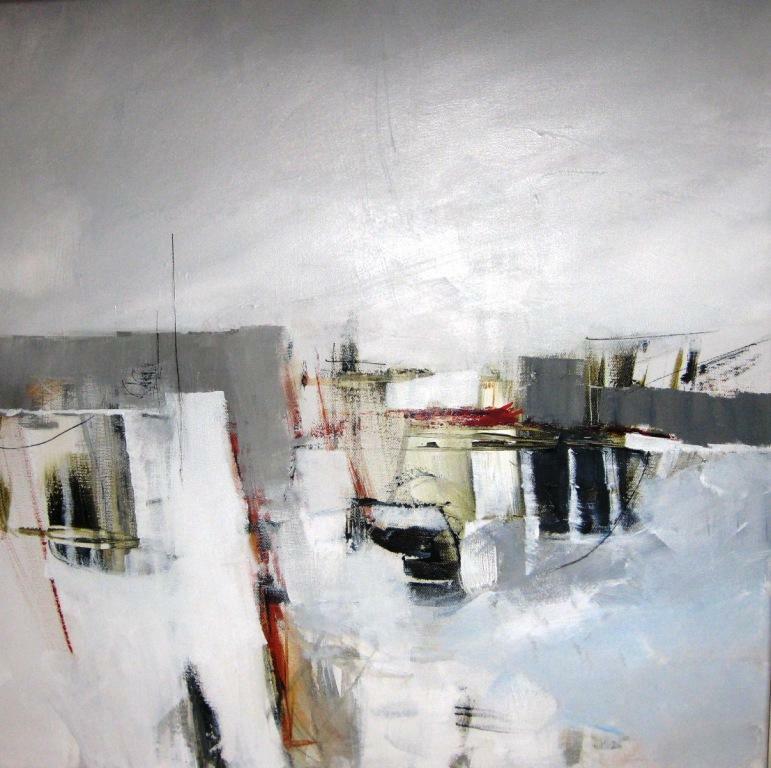 It is always difficult to know when the painting is complete; especially so with semi abstract work. I often hang a work above my PC, and glance at it from time to time; mentally evaluating how a line/ or colour would benefit from change. Invariably, I know the work is finished, when I feel I have achieved a sense of unity, balance and cohesion overall. This can take hours, or weeks. As a mature student, I gained a 2:1 Hons. Degree in Art History. Much as I enjoyed the theory, I became more excited and inspired by the artists’ work. 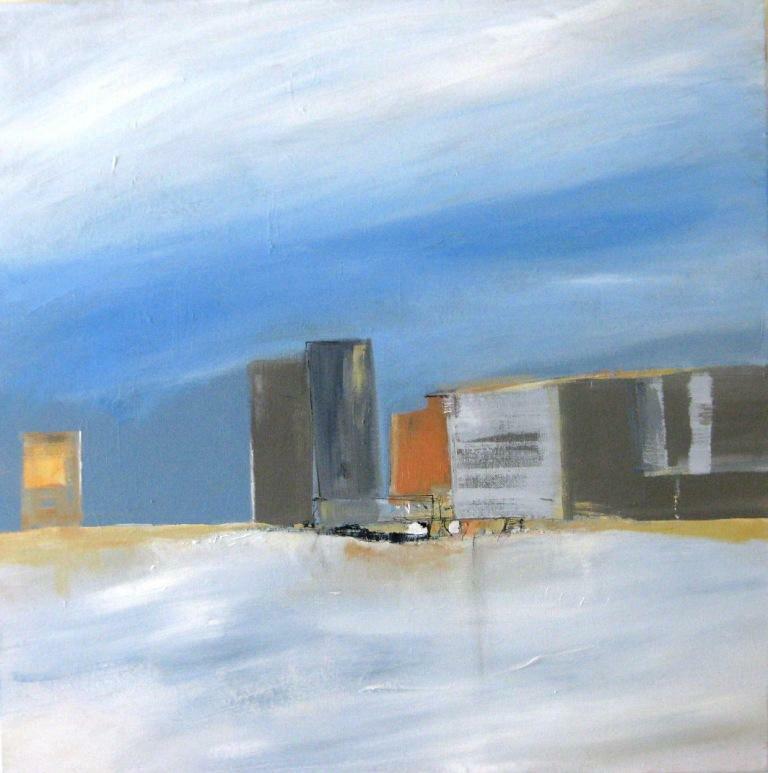 At first it was Kandinsky & Klee, then I discovered Diebenkorn, Peter Lanyon, Hans Hoffman. The list goes on. I had a friend who made me some huge convasses, and suddenly I was painting, (using old tins of household paint at that time.) A furniture design student saw my work & commissioned me for several paintings. Now that was exciting! I have exhibited in several UK Galleries, and I also sell privately through Twitter, which provides excellent marketing opportunities. For me, painting is a necessity in my life. When I sell, it’s the icing on the cake! Appreciate your work – I have a similar approach to making art. Best compliment? – your work feels right. Have a good day.